San Sebastián was worth the wait. We had had the city on our minds for months and after such a cold and rainy winter, we needed to see it in all its sunny splendor. And finally, we made it! It had been a while since the last time the four of us got to travel together and this was a chance we didn’t want to miss. This year we have barely had any getaways, so we were happy to seize this opportunity! Perhaps I should start with the biggest attraction for us: the hotel! I asked my friend Laura for neighborhoods recommendations and, without hesitation, she told me Monte Igueldo. After a short search, I found Monte Igueldo Hotel. It has incredible views of the lighthouse and, the best part: it is literally right in front of an old amusement park! It was an easy decision to pick this hotel. 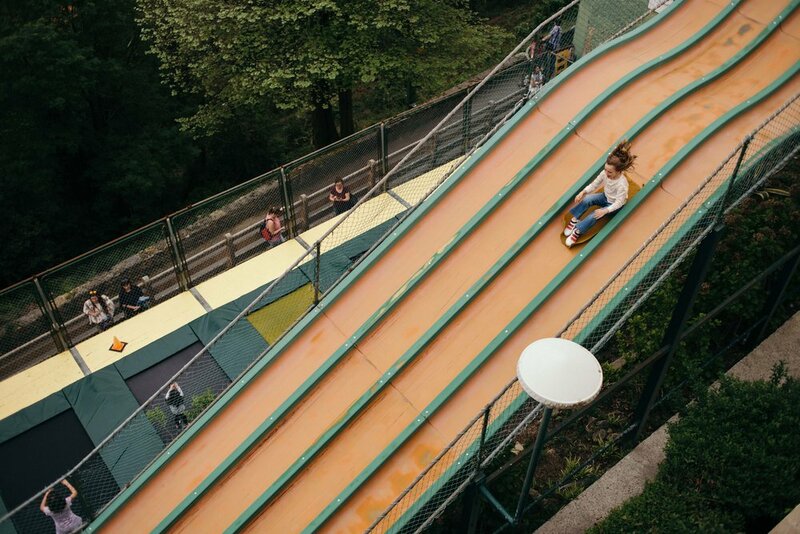 Waking up to those views in the morning is invaluable for us grown-ups, and for the kids, well… Let’s say having magic carpets, a rollercoaster and trampolines right out the door definitely scores points. Also, having the cable car right by the hotel turned this trip into a dream. True, a trip that requires a lot of going up and down might seem challenging, but for a couple of days, it was perfect for us! We really enjoyed staying in the heights. 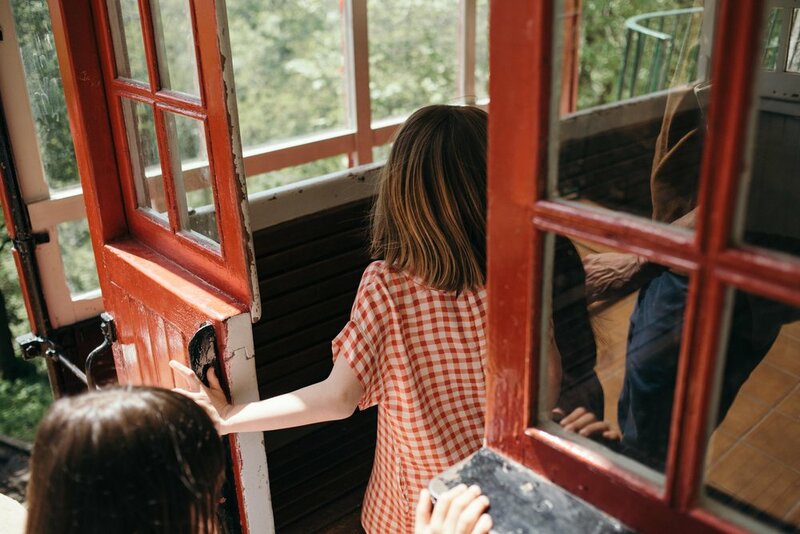 Regardless of where you stay, going up the funicular is an activity that shouldn’t be missed, especially considering how it charmingly transports you to the old Donosti. On the first day, we went down on the funicular and walked through the whole bay from Playa de Ondarreta, passing through La Concha until we got to the old side of town (Parte Vieja), where we had a delightful meal. I wouldn’t be saying anything new if I told you that San Sebastián has a hard-to-explain, unique charm. Its ambiance, its elegance, the good care the locals put into the city, its architecture, the details… From the streetlights to its magical coastline. 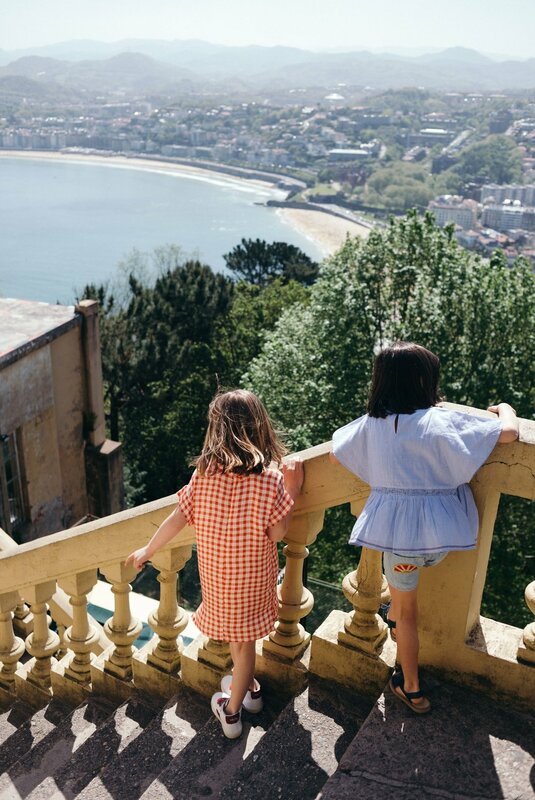 San Sebastián has a captivating charm and class. We normally are very keen on staying downtown, but Martina and Lola go nuts when they see a beach. Lola can’t wait to go down, take her shoes off, step on the sand and put her little feet in the water. She is so full of life! Our walk took us the whole morning because we really wanted to take our time, without rushing. If you want to know how the kids liked it, well, they loved it! We walked 3 kilometers from one side to the other, which got us ready for some good pintxos for lunch, or whichever delight we would find. 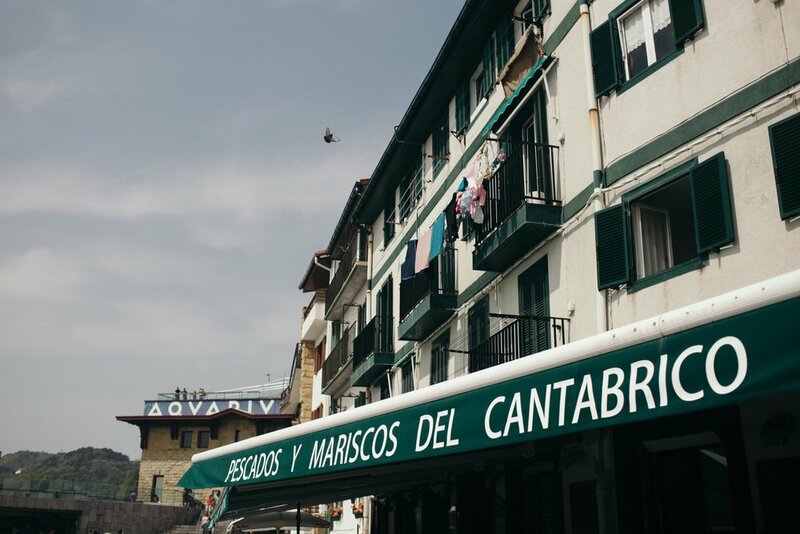 Bodega Donostiarra: the best for traditional pintxos and good, local prices. I can’t tell you you won’t be let down considering we couldn’t have any of these delicacies: every place was so full that it felt like the whole world was there. However, we know we need to come back with Tacho to make sure we get to have all these delights. 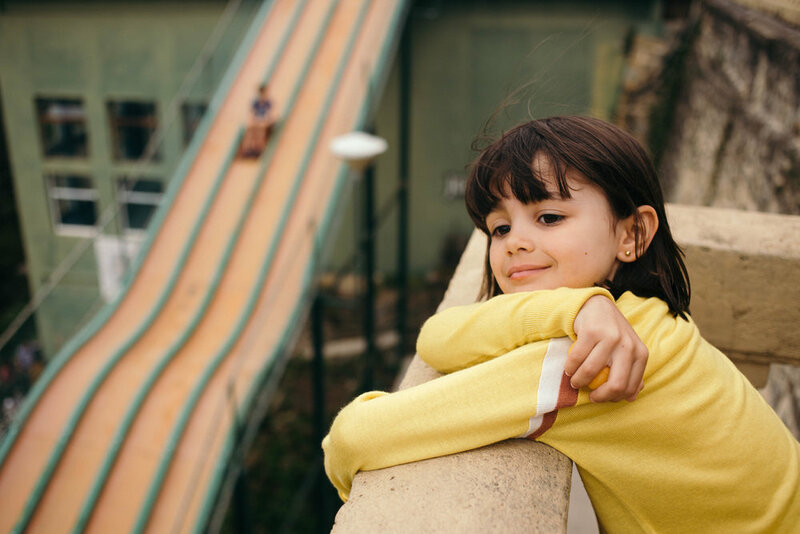 On the first magic carpet ride, the kids went together, but on the second only Rita went down, as Lola felt it gave her “tickles in the belly”, and that she would rather watch her sister from above. After a lovely afternoon on roller coasters, trampolines, carousels and magic carpets, we went downtown to see more of San Sebastián, watch people around the shops and find out what Bellerose has in the city (C/Guetaria 20). We then enjoyed one last stroll by the port during sunset before going back to the hotel for dinner—the kids favorite thing in the world! We went from Peine del Viento to the port with the intention of seeing the aquarium, but we changed our mind on the way and decided to enjoy the great weather outside with some ice cream and a visit to the port’s ramp with some toe-dipping time. Another good activity to enjoy by the port is to get some shrimp and other seafood, sold by the weight and cooked on the spot, which you can eat while enjoying the views. I loved it, but let’s just say Martina and Lola enjoyed the ice cream a little bit more. We still missed out on a lot of things and we would have loved to stay longer to take our time to enjoy the city, but we had a fantastic time in just day and a half. We left wanting more, which is an excellent excuse to come back! I hope you liked this tour and that our tips are helpful in case you are considering visiting.